New collection of only 2 luxury detached chalets and 2 extensive apartments, all with Spa. The chalets are south-facing to guarantee exceptional light inside the properties. These eagerly awaited luxury chalets and extensive apartments will enjoy a superb position in Alpe d’Huez with unbeatable ski-in ski-out situation next to lifts and close the restaurants and shops. 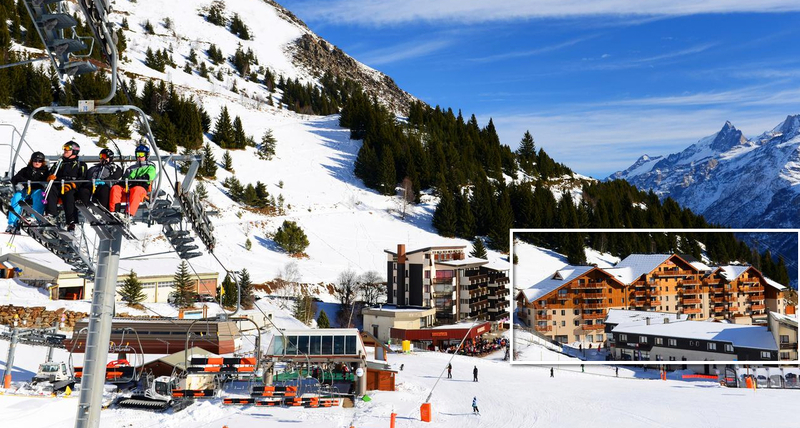 These are fully-detached chalets (only 3, one of which housing 2 apartments on 1st and 2nd floors) situated at the heart of Alpe d’Huez ski resort and offering ski-in ski-out access. These exceptional chalets and apartments are ready for delivery for the winter season starting Dec 2018. Apartments 1 & 2 come with 2 double bedrooms + a smaller bedroom for bunk beds. They both have extensive private terraces (31 & 56 sqm) and both share a Spa with jacuzzi, a shower room, a ski room and a garage. Prices (see below) include 20% VAT for an outright freehold purchase. -10% at hotel ski rental shop as well as on rooms. -Luxury fittings including fireplace, jacuzzi, private lift, ski room with boot warmers. -With the slope on your doorstep, this is ideal as a family home. Also a kid’s club and nursery is available at the 5* hotel next door for parents. The high altitude resort where you can ski in summer. With plans to link Alpe d’Huez to Les 2 Alpes as well as Les Sybelles, the future is bright with a ski domain that would be even bigger and better than 3 Valleys. Alpe d’Huez forms part of the fabulous Alpe d’Huez Grand Domaine Ski Area’ combining the resorts of Alpe d’Huez, Auris-en-Oisans, Huez-en-Oisans, Oz-en-Oisans and Vaujany into one giant, heavenly playground. Alpe d’Huez has been one of the first resorts to bring back summer skiing into it’s catalogue of summer activities.